Europe protests over taxi mobile app Jump to media player Transport in several major European cities has been disrupted by strikes by taxi drivers. Battle lines drawn in cab war Jump to media player BBC News jumps into the back of a black cab, and an Uber cab, to find out what the two sides are arguing about. Aerial video shows black cab protest Jump to media player A protest against a mobile phone app by London's taxi drivers has brought large parts of the centre of the capital to a standstill. Transport in major European cities has been disrupted by strikes by taxi drivers. 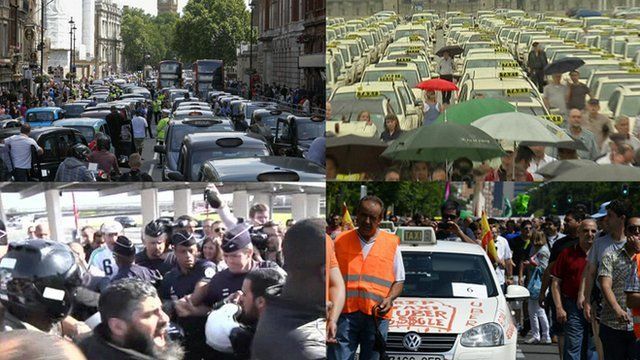 There were demonstrations by taxi drivers in Paris, London, Marseille, Madrid and several other cities. They are protesting at what they regard as a lack of regulation of mobile taxi-booking service Uber.